I finished off my review of season 7 of The Walking Dead saying how I believed season 8 would be an action packed spectacle. With New Alexandria, The Hilltop, and The Kingdom all gearing up to fight Negan (Jeffrey Dean Morgan) and his Saviors I did wonder how such an action packed set-up could be sustained for a 16 episode run. Inevitable minor spoilers for this season to follow, with obviously bigger spoilers for seasons which came before. 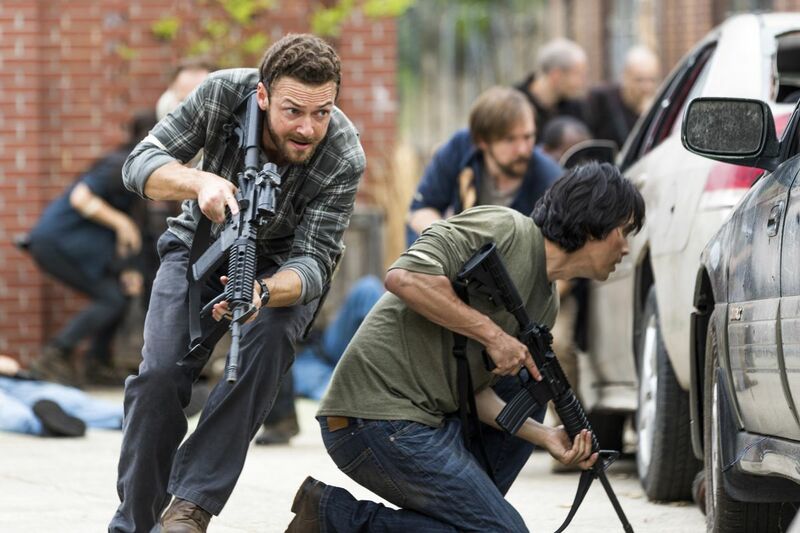 This season is all about showing the futility of fighting each other rather than banding together against the zombie threat. The way it achieves this is pretty nicely done. At the start I was on board for the complete annihilation of the Saviors, every character who started talking about stopping the killing I thought was bananas. Yet very slowly, episode by episode I came to see the truth the 'weak' characters were seeing, by the end I had changed and was instead rooting for the war to end. As usual there is a huge three month gap in between the first half and the second half, I really must start to write half my review at this point as my memory is a bit foggy. 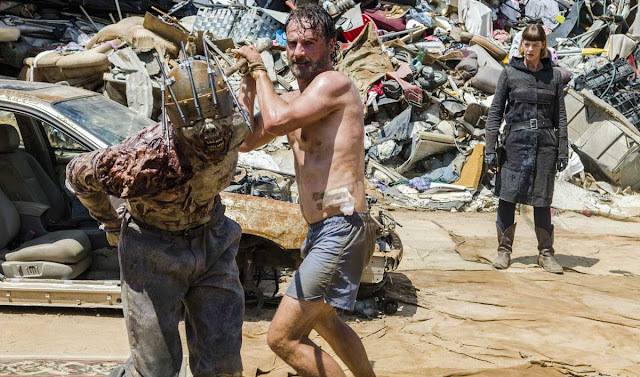 This season falls into the usual pitfalls that have plagued The Walking Dead for a long time, and it starts off pretty much exactly as I feared. No one is able to shoot straight unless the plot calls for it, all main characters have plot armour and so this led to plenty of intense gun fights where either no one at all dies, or characters who have never been shown before get offed. In the very first episode Rick has the perfect opportunity to end Negan yet is seemingly unable to shoot straight, while every chance he gets in subsequent episodes finds his trusty revolver conveniently running out of ammo whenever he has the perfect shot. Another The Walking Dead trope is how it deals with having too many characters; namely to kill them all off in one fell swoop, season 4 had the flu wipe out most the bloated cast, here other means are made to drastically cut down the shows population on at least two occasions. To the shows credit some huge long lasting dramatic actions took place that changed things forever, previously I have assumed the main core cast are invincible but that was changed with decisions that even deviated from the comic book this is based on. 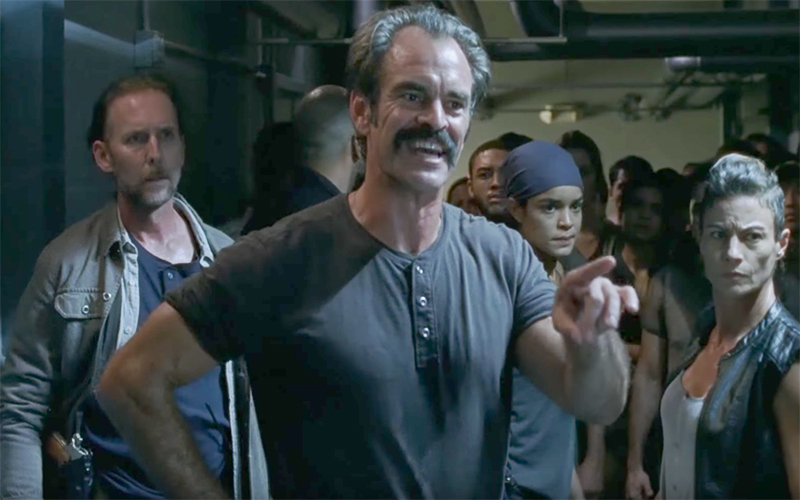 I started the season assuming Rick and his closest allies, and Negan and his lieutenants would never suffer any real misfortune, how wrong I was! More often than not though it is the no-ones who end up dead, no matter how their deaths are framed I find it hard to care when I can't even really remember if they have showed up previously. This issue even applies to the main cast, there is a woman who joined the team in season 4 and I still don't know what her name is! 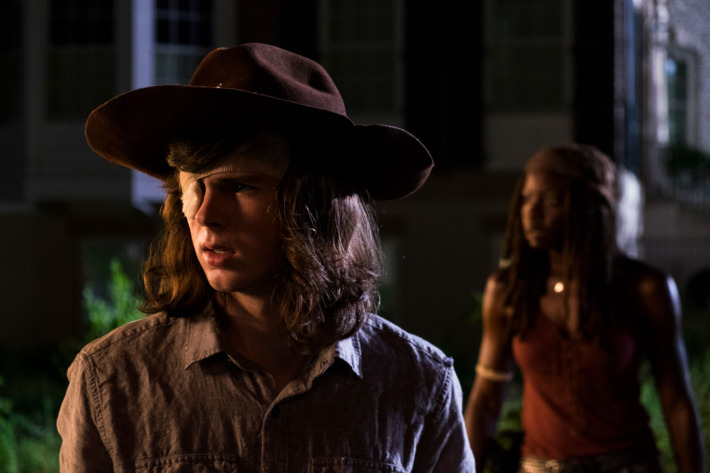 Of the good guys there isn't a tremendous amount of change with the more popular actors getting reduced screen time, it was good to see my favourite Carl Poppa (Chandler Riggs) getting to do more, having a pivotal role in the main plot, Rick and Michonne are as good as ever, while Maggie, Daryl (Norman Reedus) and others get an evolution of sorts in how their emotions are leading them down darker paths, and then there is Morgan who is going ever more deeply into the realm of the insane. This is a show that does its bad guys very well, as with season 7 Simon (Steven Ogg) is just a fantastic character, he manages to be an awful person while being hilariously funny, someone you love to hate. This is down to the actor who is just amazing. Dean Morgan is another actor who just seemed born to play the role he was given. We have already seen just what a terrifying presence he can be so it was great to see the humanity behind his scary facade. There are several points in this season where we get to see his other side, you get to see that he is not some one dimensional antagonist, but someone who has feelings, and who does care about people, whether it be his talking about his past, such as why his baseball bat is named Lucille, or his genuine shock and sadness at hearing bad news about people he by all means shouldn't care about. It makes it all the more disappointing when he reverts back to being traditional Negan, seemingly only showing true compassion when the script calls for it. The decision to turn Eugene into a bad guy was a genius move, he may be a coward but he is one who flourishes with a heel change where before he was just pretty bland. There is a lot of spectacle this season with even the mid-season finale dwarfing previous shows finales (the mildly lame season 3 one comes to mind). Then there is the proper finale itself that almost (but not quite) could have been a final episode to end the whole show in its entirety. Having only just seen this final episode my emotions are still high from it, needless to say it had some fantastic moments, and my favourite scene from the whole of season 8. One of my favourite episodes this season broke up the format a little bit, it was split into different sections focusing on different characters, each starting with a black screen and a title card to let you know who the focus was on, I can't remember which episode this was (apologies) but it was a stand out episode in a sea of good ones, there is no filler this time around and not a single bad episode. It was also great to see Rick and Negan have several different one on one fights throughout this, helps set them up as the polar opposites Rick thinks them to be. 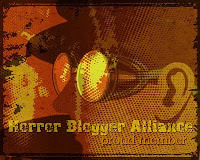 All this and I have not even mentioned the zombies themselves, well the idea of this was never to focus on the corpses, but they are in abundance here with a wide variety of quite weathered looking ones to enjoy. Saying that one of the first you see in the first episode was perhaps the worst looking one to grace this programme, me and my friend both commented how plain bad the make-up on it looked, thankfully things improve a lot. While I don't necessarily agree with the dried up look gone for in the later iterations of the undead at least it is consistent, and there is plenty of gruesome violence done to the poor brain dead ghouls. 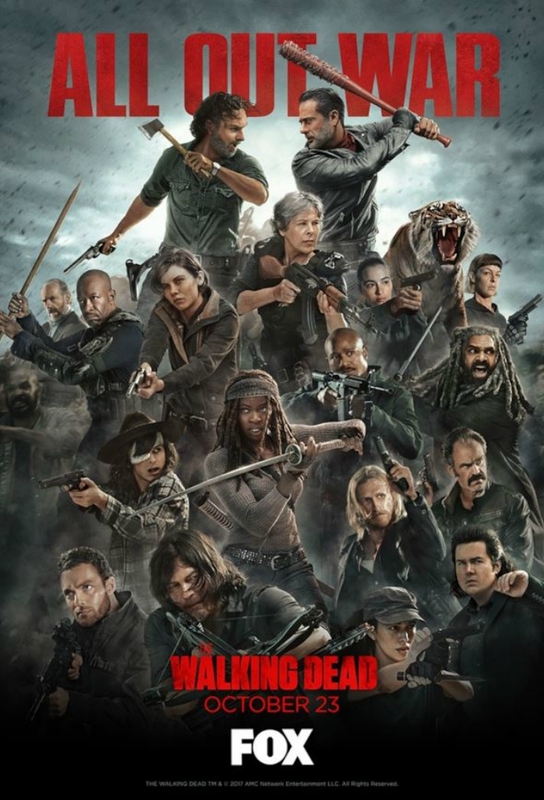 The ability for The Walking Dead to make my heart go in my mouth is still there, I just do not understand people who say this show has become dull and stupid, for me it is as good as it ever was. While this wasn't as a tense series as the traumatic season 7 it was exactly what it set itself up to be; an action packed thrill ride, even if it may have benefited from a little bit more down time every now and again.